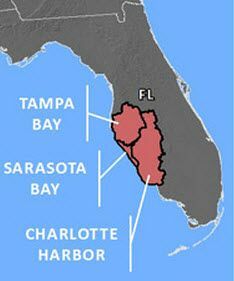 A Joint Management Board Meeting of the Tampa Bay Estuary Program, the Charlotte Harbor National Estuary Program, and the Sarasota Bay Estuary Program will be held Friday, Nov. 9 from 9 a.m.-noon at the Manatee County Administrative Center, 1112 Manatee Avenue West, Fourth Floor, Bradenton. The purpose of the meeting is to develop recommendations for develop recommendations for Joint Policy Board consideration for the SW Florida Regional Ecosystem Restoration Plan. The Policy Boards of the Tampa Bay Estuary Program, Sarasota Bay Estuary Program and Charlotte Harbor National Estuary Program will meet jointly on Friday, Nov. 16 at 10 a.m. to consider projects for inclusion in the Southwest Florida Regional Ecosystem Restoration Plan. The meeting will be held at the Bradenton Area Convention Center (formerly Manatee Convention Center), One Haben Blvd., Palmetto, Florida. Copies of the agendas may be obtained by contacting Ms. Liz Donley: (866) 835-5785 or ldonley@swfrpc.org. If you require special assistance to attend either meeting, please contact Ron Hosler. Please note that if a person decides to appeal any decision made by the Estuary Programs’ Boards to any matter considered at the above cited meeting, he/she will need to ensure that a verbatim record of the proceedings is made, which record includes the testimony and evidence upon which the appeal is based.